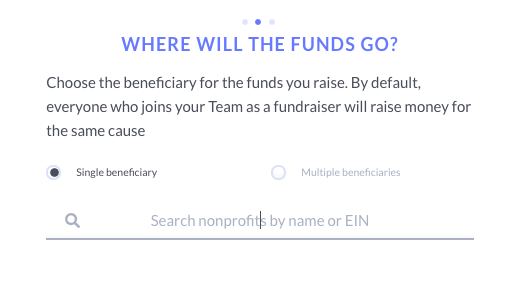 Select "Start Fundraising" at the top of your page. Scroll to the bottom and select "Create an Event"
Next, you will need to decide whether you’d like your event to support a single cause or multiple causes. This depends on what kind of campaign you’re running. Are you a nonprofit employee organizing your volunteers to fundraise together? 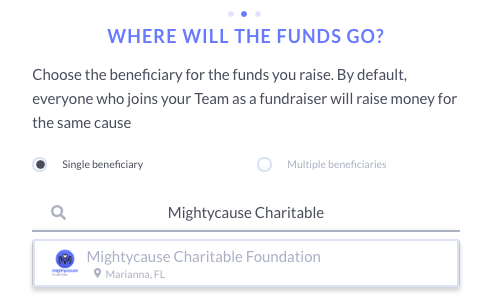 Then you’ll click "Singe beneficiary,” because you want all of your event members to raise money for your nonprofit. Are you spearheading a holiday fundraising effort for your company and don’t have any particular cause in mind? Then you’ll click “Multiple beneficiaries,” because you want your event members to pick their own cause. Think about the kind of event you want to create and why you’re raising money, and choose accordingly. 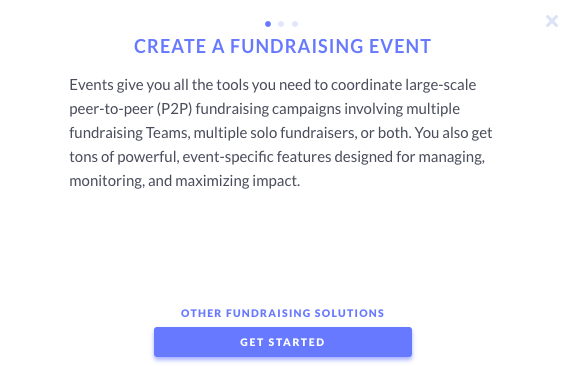 There are a few more variables here that you’ll want to consider, as you’ll see on the next screen, because we also allow event and team fundraising for personal causes. But don’t worry, none of these choices are engraved in stone, so you can just click back if you need to change your mind. You’ll need to decide whether you’d like to limit your event members to charitable causes, or whether you’d like to allow personal causes as well. 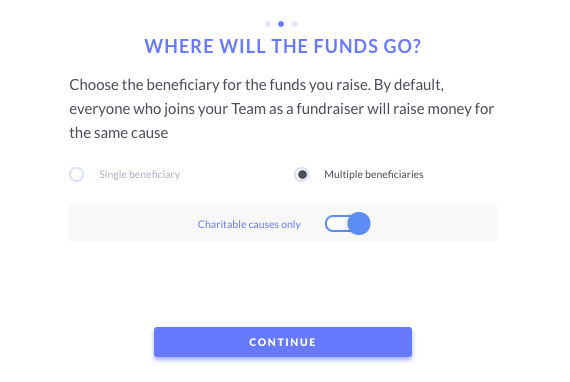 If you want to limit your fundraising activities to charitable organizations, but allow each event member to pick any organization they’d like to support, you’ll keep the switch turned on to "Charitable causes only"
There are plenty of situations when you might want to allow personal fundraisers. So, if you’d like to allow for some flexibility in what kinds of fundraisers may be part of your event, you’ll turn off the switch. Both of these can be used to make sure you’re choosing the correct charity. If you’re starting an event for a chapter of a national organization or a charity with a common name, such as a humane society, you’ll want to check both the location and the EIN to ensure that you’re choosing the right one. We can’t move your event over to support another charity if you’ve already chosen one and started raising money, so it’s important to make sure you’ve chosen the right one! After you’ve made those important decisions, that’s it! Select "Launch Event Manager" and you can start customizing your event page. 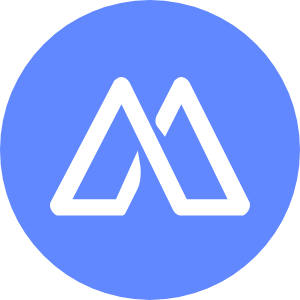 For step-by-step guides on how to design your page and utilize all of our event tools, check out How to Make Your Event Page Awesome and Guide to Designing Your Event Page on Mightycause.